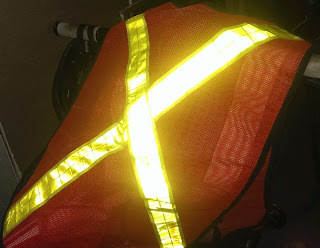 Time to break out the high visibility vests for your commute. It might also be a good idea to check the reflectivity of your bike. 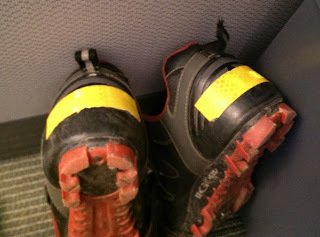 I found these strips of 3M tape to be quite effective, I placed them on my backpack, heels of my shoes, wrapped some around a few spokes and stuck a bit on the handlebar. It weighs next to nothing and works quite well. And one final note to the girl riding without lights on the dark trail for the last few years scaring the crap out of me... please realize that you are completely invisible to anybody else. Just because you can see where you are going doesn't mean others can see you and where you are going!